Tired of end-user complaints about VoIP call quality? Watch how SolarWinds® VoIP & Network Quality Manager monitors WAN performance of your remote sites by tracking key edge-to-edge router and VoIP call paths to ensure call quality using Cisco IP SLA technology that can be used standalone or integrated seamlessly with Network Performance Monitor. VoIP & Network Quality Manager correlates call detail records (CDRs) with Cisco IP SLA Operations, and delivers VoIP call statistics for VoIP troubleshooting through a highly intuitive web interface that offers point-and-click simplicity and easy access to call performance statistics. Plus, you can search, filter, and report on problematic calls, find other calls affected and potential patterns on Cisco VoIP networks, and get to the root of the problem to improve VoIP call quality. Finally, you can monitor key WAN applications by analyzing the performance of the underlying network protocols, including DNS lookups, FTP, HTTP, UDP jitter, and TCP connect, even in firewalled environments. Go ahead and start troubleshooting your VoIP environment and stop the VoIP call complainers with VoIP & Network Quality Manager! Stay ahead of call quality issues and end-user complaints with SolarWinds® VoIP & Network Quality Manager. Drill in to see the utilization of PRI trunks, data distribution, and more. VNQM provides detailed information on Cisco® and Avaya® Communication managers, including registered and unregistered phones. Click either the Node Details or the Cisco SIP trunks between Call Manager clusters for deeper troubleshooting. The SIP Trunk Summary page provides detailed information, including audio and video call activity and up/down status. Easily set up IP SLA operations in VNQM to test a variety of connections across the WAN to track down and resolve connectivity issues more quickly. For example, this operation shows there are issues with packet loss, jitter, and latency. 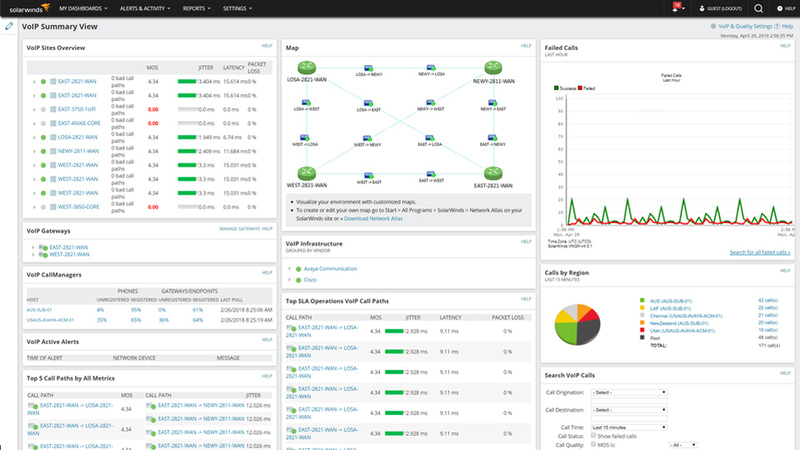 The Call Details page allows for hop-by-hop troubleshooting and analysis of the call path. Gain proactive VoIP and WAN performance monitoring and troubleshooting with SolarWinds VNQM.